Since May 2016 it’s been the law that businesses making sales and marketing calls are required to show a telephone number (CLI) when making calls. This in turn generates inbound call backs from those people calling you back. We can provide you with automated answering services to handle your call backs from all of those missed calls. You can opt for a simple “…sorry we missed you…” kind of message or go further and additionally offer a “…if you no longer wish to receive calls from us…” opt-out option that collects the telephone numbers of the opt-outs and pops them directly into a Do Not Call (DNC) database within your TPS Services account. 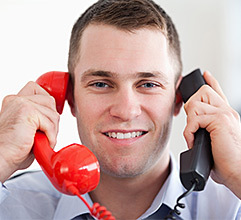 Some companies prefer to use a non-identifiable voice for their call answering services. Computer generated voices can give the caller the confirmation they are not talking to an individual and can give them the feeling that this is simply a ’process‘ rather than ’one of those automated menus‘.